Thought I'd jump in with The Daily Marker 30Day Coloring Challenge even though it's already halfway through. 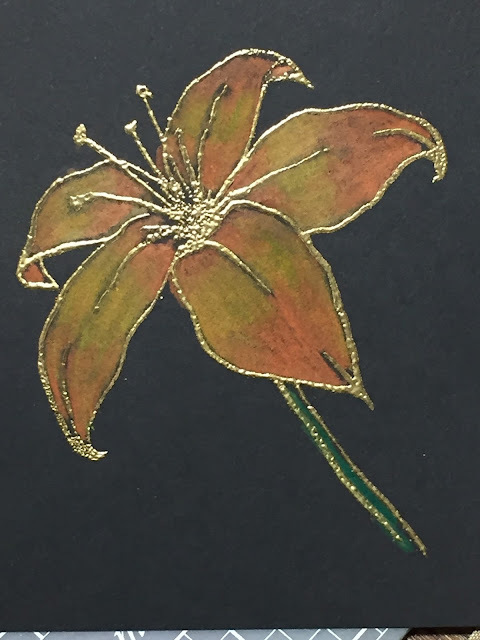 I did this on Gina K Designs Pure Luxury Cardstock in Black Onyx after embossing the flower in gold for drama (and an outline to stay inside). I'm always amazed at how the penciled colors stand out against a dark background, especially on such high-quality cardstock! After I colored the lily with my Prismacolor pencils, I went over it with my blending pens. The result was not quite as smooth as if I had used watercolor pencils, but instead created an almost hand-painted look with a little sheen (which you can't really see here). All in all, a lot of fun. I just might get one or two more projects colored before the challenge ends! Thanks for looking.